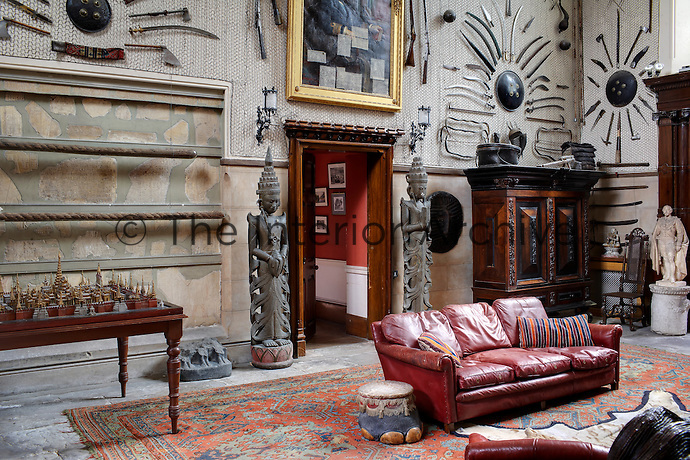 Inside the house on the Clandeboye estate, which is the home to Lady Dufferin, Marchioness of Dufferin and Ava. The inner hall, weaponry, heraldy and hunting prizes line the wall. Egyptian sculptures, Burmese wood carvings, stuffed grizzly bears and rhinoceros heads as well as many other treasures and curiosities were brought back to Clandeboye by the 1st Marquess.